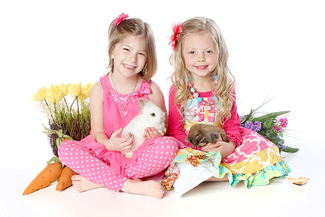 Once again, Absolute Photography will provide cute, fluffy baby bunnies and baby chicks for a unique photo shoot for your children. This is our favorite event of the year! The cost is $55 per group to be photographed with the bunnies and chicks. Additional poses within the same immediate family may be added for $25/pose. For example, if you have two children and would like them in the first portrait, and then their portraits were taken individually, the cost would be $105 — $55 for the first pose and two $25 additional poses. As in the past, this is a charity event!. I highly encourage you to make a donation to my charity of choice — the Pug Rescue Network. This Michigan based rescue was founded in 2004 and their goal is to embrace the neglected, forgotten and displaced Pugs with compassion, providing hope through education and awareness, and helping them by finding their way to a permanent loving home. Those who know me know I LOVE pugs and my very own Dylan (who passed away recently) was rescued from PRN. In exchange for your donation of $10 or more, I will gift you a free 15 minute outdoor mini session! Please make your donation (cash or check to Pug Rescue Network) at the Easter event and pick up your certificate. I will have one or two lovely assistants helping me with orders. You can pay with cash, check or credit card. If you have any additional questions regarding this event, please let me know! I am SUPER excited for this event and am looking forward to seeing old friends and meeting new!